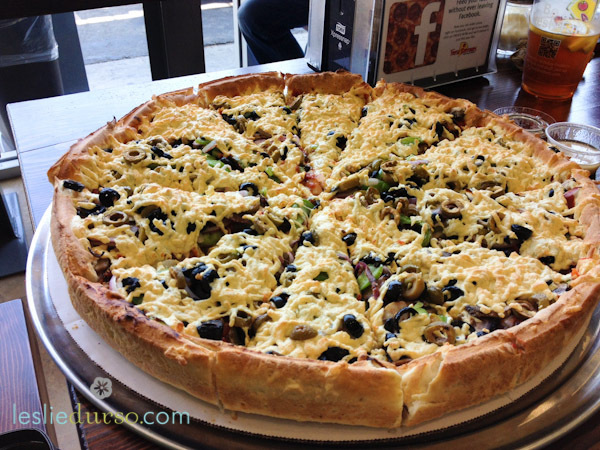 Fresh Brothers tantalized our tastebuds with an array of thin crust, gluten-free, and deep dish pizzas (all vegan of course!) They top their vegan pizzas with Daiya Cheese. Which typically I don’t like (you all know I’m not a fan of the processed foods) but I have to say it wasn’t too bad! I think when I go back I’ll order it “light on the cheese”. But man, I’m still dreaming of that deep dish crust! Two big thumbs up from this gal! Fresh Brothers is a welcomed delight to the list of vegan and gluten free places in Los Angeles! If you are having a pizza party, don’t forget to invite me!